Peru has no alternative other than to cede gas market share in Mexico to the US and seek increased exports to Europe and Asia. Hydraulic fracturing in the US has taken an economic toll on resource-rich Peru, home to Peru LNG, the first natural gas liquefaction plant built in South America and the second in the Latin America and Caribbean (LAC) region. The US shale gas boom has produced substantial volumes of economically favourable gas that continues to find its way into Mexico. In recent years, this has allowed the US to slowly chip away at a once-solid gas market for Peru. Cargoes from Peru LNG cannot compete with gas produced in the Permian and Eagle Ford gas plays, Mexico City-based consultancy GMEC [DL1] general director Gonzalo Monroy told NGW. Despite losing market share in Mexico, Peru has maintained relatively steady gas export volumes, primarily to European and Asian markets. Peru’s proved oil resources are the second smallest in the LAC region, ahead of only Trinidad and Tobago, but its proved gas resources are the second largest in the region, behind only Venezuela, according to BP’s Statistical Review of World Energy. Peru’s gas production was 13bn m3 in 2017, while gas consumption was just 6.7bn m3, according to BP. This compares to gas production of 7.3bn m3 and consumption of 4.9bn m3 in 2010 when Peru LNG began operations. Between June 2010 and the end of 2017, Peru reported consumption growth of 162.5% compared to gas production growth of just 78.1%. Still, Peru has maintained a large gas surplus, which has allowed it to remain a net exporter of gas. Much of Peru’s continued success outside the Americas is related to its ample supply of resources and robust global gas demand, especially in Spain and Asia. In Asia, especially, demand growth is driven by efforts to reduce coal consumption and accompanying CO2 emissions. Export growth – particularly in Europe and Asia – was given a boost in 2014, when Shell International Trading Middle East (SITME) took over from Spain’s Repsol as Peru LNG’s controlling offtaker. Peru’s economy is projected to grow 3.8% in 2019, 3.8% in 2020 and 3.7% in 2021, according to recent World Bank estimates, well ahead of average growth projections in the LAC region. Peru LNG’s 4.45mn mt/yr liquefaction plant is operated by Hunt Oil, with a 50% interest. Other partners include Anglo-Dutch major Shell (20%), SK Innovation (20%) and Marubeni Corporation (10%). The plant is part of a 521-ha complex located 170 km south of Lima, and includes one LNG train, a marine terminal, two storage tanks, and a supply pipeline. The $3.8bn investment in the project was the largest direct private foreign development in the country when completed in 2010, according to Peru LNG. Supply for the plant is sourced from Peru’s Camisea gas fields, in central Peru, and delivered via a 408-km, 1.3bn ft³/day pipeline. Located entirely onshore, Peru’s gas reserves totalled 0.4 trillion m3 at year-end 2017, while its oil reserves totalled 1.2bn barrels, according to BP. Over the next decade, the country hopes to boost production to 19.3bn m3 by 2029 or 2030, according to the country’s state energy agency PeruPetro. Since 2010, and apart from early exports to Mexico, Peru LNG cargoes have been mainly focused on the European and Asian markets, where demand for LNG imports has remained strong. Between 2010 and 2017, Peru LNG cargoes went mainly to four countries: Mexico, Spain, South Korea and Japan. Of the cargo shipments during this seven-year period, the bulk went to Mexico (roughly 40% of the total), followed by Spain (38%). The remaining 22% were sent mainly to Asian countries, including Thailand and China, while lesser cargoes were sent to France and the US. Now, however, most volumes initially targeted to Mexico are being redirected by Shell to more lucrative markets in Japan and Korea. Only enough gas is sent to Mexico to maintain the cold regasification facilities there, Monroy said. Given those marketing changes, the future for Peruvian LNG in Mexico does not look promising. 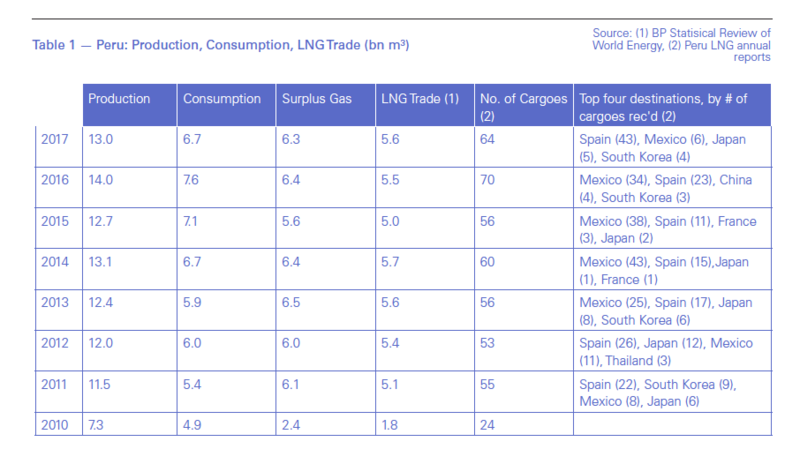 LNG’s role in Mexico has evolved in the last years. Since 2013, Mexico’s Federal Electricity Commission (CFE) has auctioned several pipeline projects with a key emphasis on developing new takeaway capacity from west and south Texas. As this new infrastructure started commercial operation, the available of cheap gas from the Permian Basin in the US reduced the demand for LNG imports. Since 2016, however, local opposition has delayed construction of nine major pipeline projects and one branch line, and interest in LNG imports has recovered somewhat, at least for now, Wood Mackenzie research analyst Rodrigo Rosas told NGW. With declining demand from Mexico, Peru’s LNG future will be increasingly tied to the economies of Europe and Asia, which both look promising over the medium-to-long terms. In Asia, the outlook for Peru LNG will likely improve given the IEA’s forecasts that China and other developing Asian markets will boost their share of trade greatly to reach 45% of trade volumes by 2023, up more than double the share of 2013. In Spain, the outlook for Peru LNG will remain positive amid steps the European country is taking towards decarbonisation of its economy. Spain plans to boost the share of renewables in its primary energy mix between the 2015 and 2030, while reducing nuclear, oil, and coal. The share of natural gas, however, is expected to remain at about 20%.